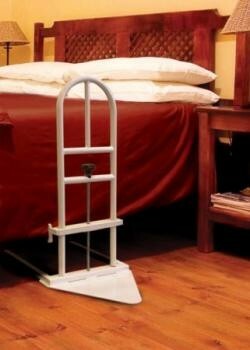 This bed rail is the ideal solution to help get in or out of bed. Its attractive, ergonomic design complements virtually any bedroom. Functional, strong, hygienic and safe, provides the user with confidence and independence. This bed rail is the ideal solution to help get in or out of bed. Its attractive, ergonomic design complements virtually any bedroom. Functional, strong, hygienic and safe, provides the user with confidence and independence. Stored flat when not in use, it can be easily assembled and quickly fitted to the bed without the use of tools. Designed for use with electrically adjustable beds, the bed rail can also be used on domestic beds including divans, pine and steel or wooden frame beds. Fits to single or double beds on either side, with a clamp that firmly sits between the floor and the bed base. Comes complete with a full length and width steel floor frame for added stability. The front base is flat so there is no tripping hazard or obstacle to wheelchairs or walking frames.